With this ornament I was inspired by a decorating project I saw on Pinterest. Old maps were used to cover books and I wondered if I could use maps with my ornaments. 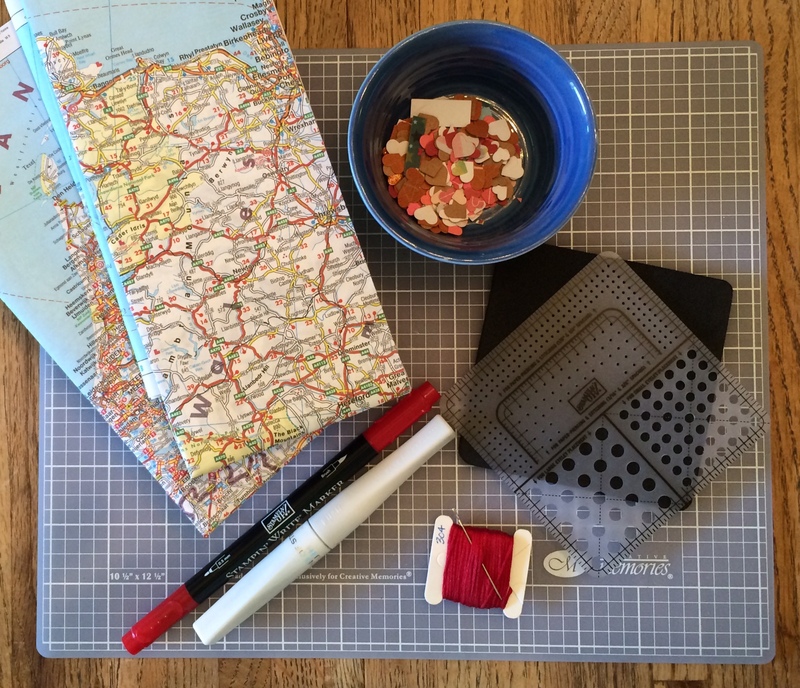 I knew I could sew on paper with my machine and gave that a whirl, but it really didn’t give me the effect I was looking for. Then I remembered those old sewing cards I had as a kid and I knew what I wanted to do. 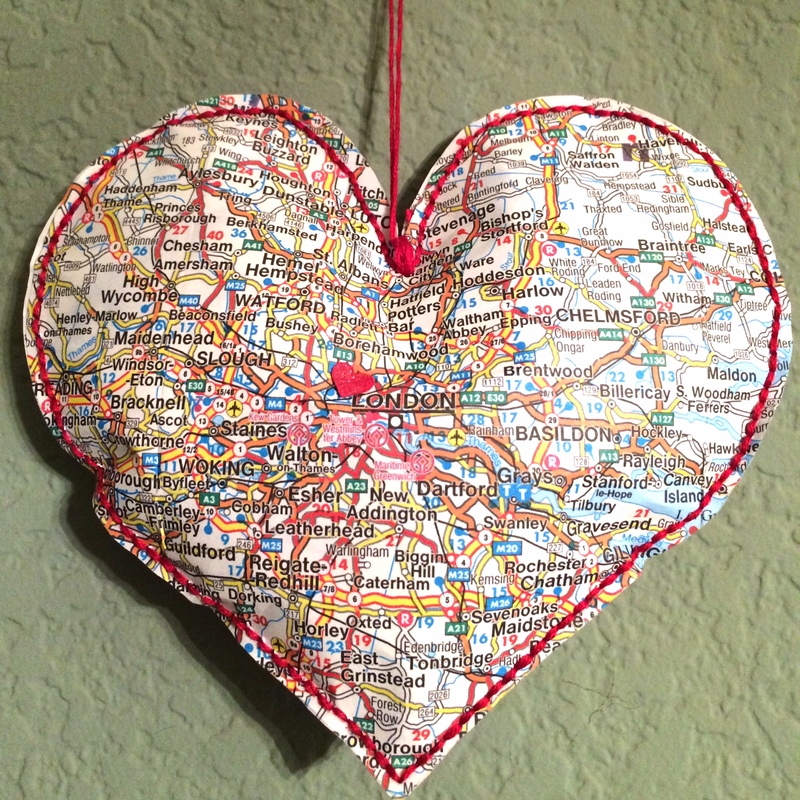 I decided to use a heart shape again (one of my favorite shapes) and cut one large and one small out of my maps. I made a template using an old cereal box and traced two of each size. For each tracing I made sure there was a major city visible on the heart. 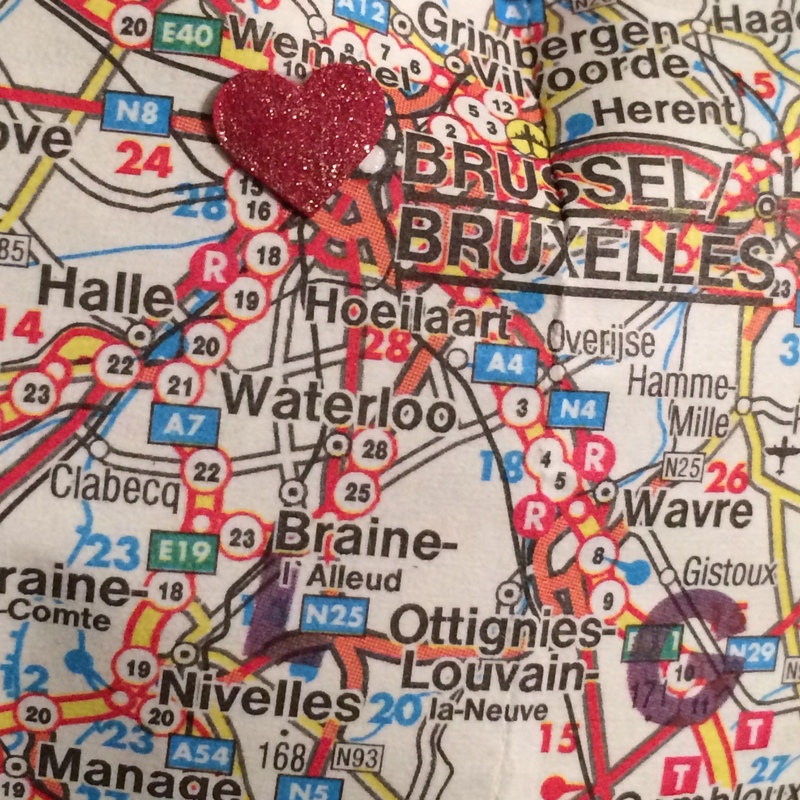 For the big heart, I chose two cities in England (where my family’s from) and for the little heart I chose Brussels and Paris. 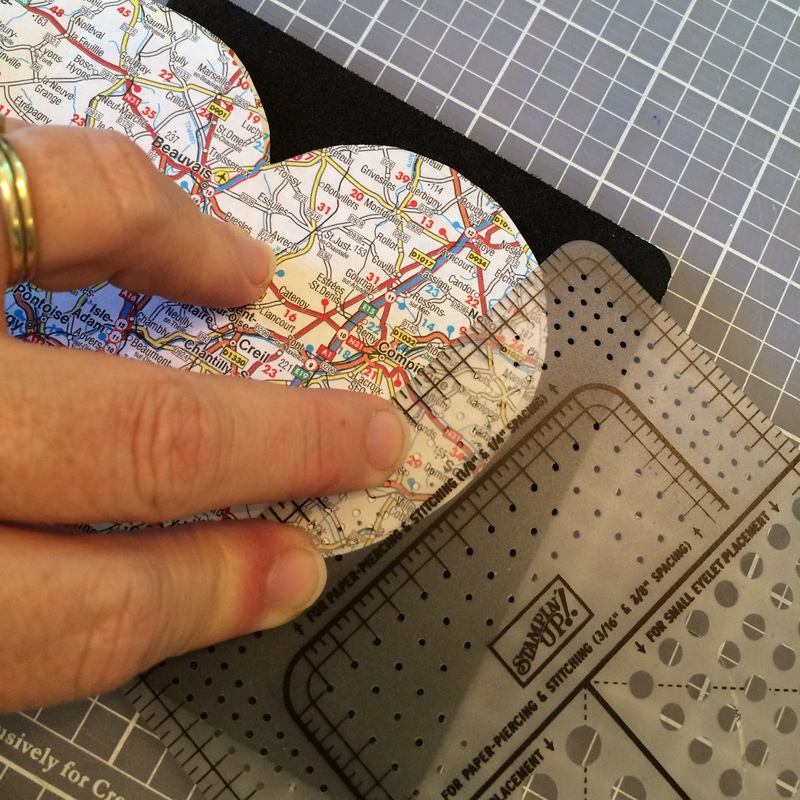 I cut out the hearts and then used my paper piercer to make evenly spaced holes around the perimeter of each heart. I used red embroidery floss (4 strands) and did a running stitch on the small heart and a backstitch on the large heart. 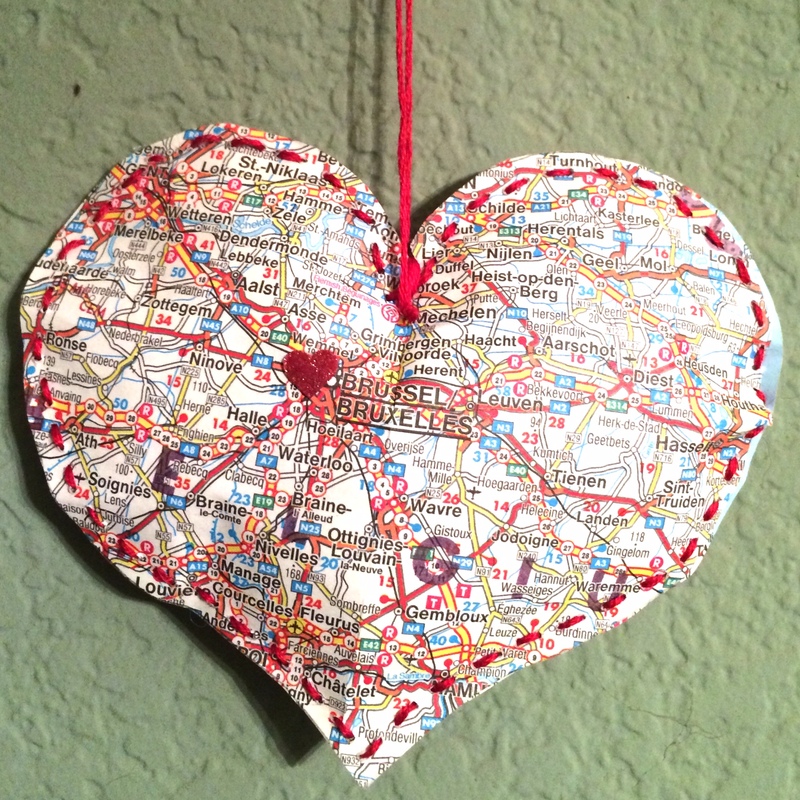 I stuffed both of them with polyester fiberfill to give the ornaments some dimension and then glued glittery hearts near each major city. I’m really pleased with how they turned out. This isn’t a traditional ornament, but it could make a really cute gift ornament for a newly married couple, someone new to the area or any occasion where you want to make note of a special location. I love fresh flowers and love the idea of being able to go into my backyard, snip a bouquet of colorful beauties, pop them in a mason jar and set them on our table or better yet give them to someone. I figure while I’m in the yard tending to the vegetables and the fairies, I might as well grow flowers. Question of the Day: What is your favorite family tradition over the holidays? 1) Leave a comment on each day’s post by answering my “Question of the Day”. The “Question of the Day” will be right above my closing. 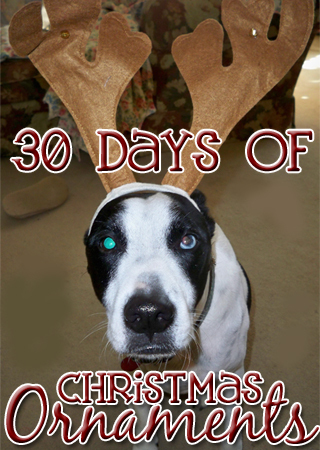 2) Over the course of this blog series, you can enter a maximum of 30 times. On December 1, 2014, I will have a random drawing for one (1) lucky winner. I will contact the winner for their mailing details and will mail to anywhere in the world. So you’re planting a vegetable garden, a cutting garden and making a garden for these fairy creatures. Is there going to be any backyard left for us? 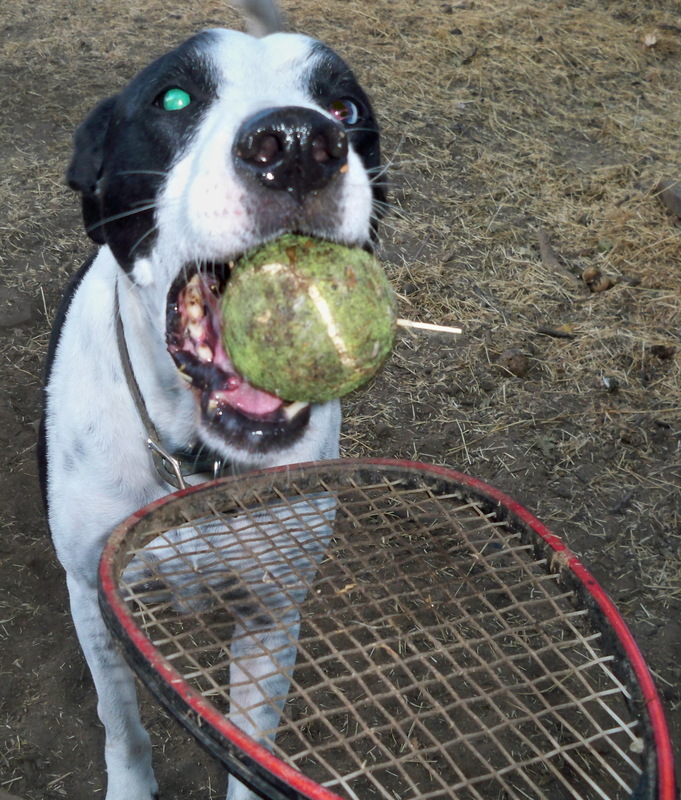 I need space to flex my ball-catching muscles. Sorry for talking with my mouth full. This entry was posted in 30 Days of Christmas Ornaments, Accountability, Backyard, Challenges and Contests, Christmas, Decorating, Dogs, Gardening, Goals, Homemade, Quest46, Repurposing, sewing and tagged 30 Days of Christmas Ornaments, accountability, backyard, Challenges and Contests, Christmas, Decorating, Dogs, Gardening, goals, homemade, Quest46, repurposing, sewing. Bookmark the permalink. Would that special one be Snoopy? My family tradition is that we always open our stockings first then the presents. We have that tradition also. Traveling to the foothills to cut down our xmas tree. Going to my grandmother’s house on Christmas Eve! We don’t really do much special there besides hang out with family but I always go with my mom and brother. And I made a sort of ornament like that last year! Only I made it big enough to hang on the wall for my friend who lives in another state; one side had a map of her town, the other side had a map of mine! I think just hanging out is the best. No pressure. That’s a great idea about the two towns. I have a pen pal in Australia and I think I’ll do that for her. Awesome idea! Christmas Breakfast! We make the “kids” wait until we are done before opening any gifts, and then go around the room present by present. Drives them nuts!! What are parents for? Yikes!! Sounds like an effective form of torture. Lol. Christmas Eve – reading the Bible story of Jesus’ birth and going to church. Christmas Day – stockings filled with all sorts of little presents from Santa. Our kids usually got up before us, would bring them into our bedroom, wake us up, and open all the stocking gifts while we watched. Loved their excitement and family closeness. Was always enough in the stockings to keep them content until we were up and able to fix breakfast. Now we have stockings for all the extended family who celebrate with us. It gives them small things to open as the more immediate family has larger gifts to open – we take turns, youngest to oldest. Sounds like a wonderful tradition. I love this ornament, so many possibilities!